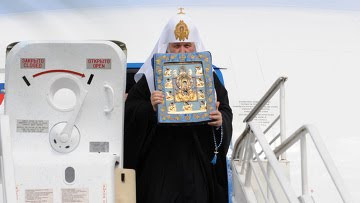 The head of the Russian Orthodox Church on Wednesday led a procession through the city of Kursk, 300 miles south of Moscow, to celebrate the arrival of a miracle-working icon from the United States. Patriarch Kirill of Moscow and All Russia carried the icon, called the Kursk Root Icon of Our Lady of the Sign, through the streets, where it was welcomed by over 30,000 people - almost 10% of the city's population. The icon was brought to Russia on September 12 and was kept in central Moscow's Christ the Savior Cathedral before its departure for Kursk. In early October it will be returned to the United States. Church spokesman Vladimir Legoida said over 150,000 believers came to pray before the icon while it was in Moscow. "It is one of the most venerated miracle-working icons in the Russian Orthodox Church. It was discovered in the 13th century, and our ancestors always turned to it in hard times," he said. "The stay of such a shrine in Russia is a very important event in the church life. And the bringing of the icon to Kursk, where it was found, is certainly a symbolic event with historical significance," the spokesman said. The Kursk Root icon of the Mother of God dates back to the 13th century. A hunter from the city of Rylsk near Kursk came across a small icon lying face down on a root of a tree in the year 1295. He picked it up, and a spring of pure water gushed from the place it lay upon. Numerous miracles were later attributed to the icon. Legend has it that once late in the 14th century, when Tartars came to raid the Kursk Region and cut the icon in two, the two halves grew together, leaving a small trace of the break. In 1920 the Kursk Root icon left Russia as many faithful fled the country following the 1917 Bolshevik Revolution that saw the start of a large-scale persecution of Christians. The icon traveled from place to place, including Serbia and Germany, and was finally taken to the United States.